User level, what is the minimum level for commands use (from everyone - Super Moderator). Global command cooldown in seconds. Default Commands Lists all default StreamElements commands. Variables Listing of all StreamElements variables. Enabled Turns command on and off. !chatStats Displays a link to the account chatstats. !commands Links to the channel commands list. !givepoints Users can grant each other points. !points Displays users points and leaderboard ranking. Does !watchtime count the total time including when you didnt have the bot in chat before? My !addpoints command doesn't work, how do i get it to work? HOW do I hide the ! 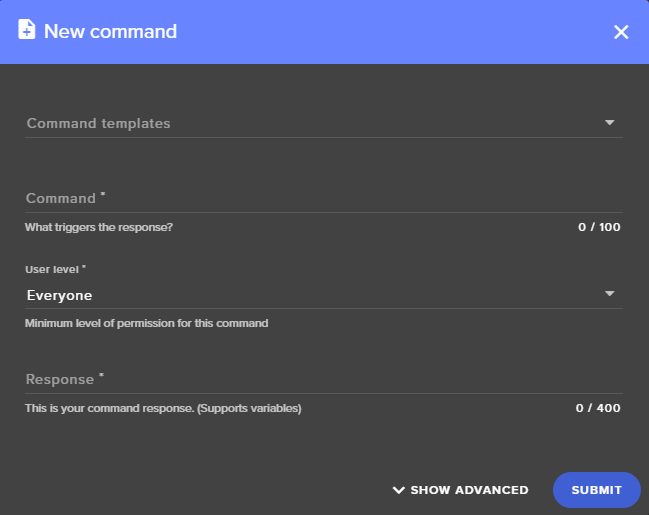 commands and still let them work? That would make this a perfect women. For the !addpoints command to work it needs to be enabled in Chat Commands. - Then it sends the user their points and updates the leaderboard. But also sends them a whisper saying "You have been rewarded with x points"
Hope this is possible thanks in advance for replies.